Apple is widely regarded as one of the most innovative tech companies out there. I see time and time again headlines that praise the company for their impact on the world of technology and hold the company up as a beacon of light that leads us all to the future of technological nirvana. Nearly every new product is heralded as a success before it even launches. I know that sounds over the top but it’s really how Apple has been portrayed over the last decade. The only thing containing more hyperbole than an Apple keynote speech is the media’s reaction to it. However, with yesterday’s announcement of a new New iPad – just 7 months after the last “new iPad” was released – and an iPad mini, which basically takes old hardware and shoves it into a copycat small form factor, I can’t help but think Apple has stopped innovating. At least for the time being. In fact, when I look back at Apple’s very successful recent history (the last ten years, or so), I can only think of two products that were actually innovative: the iPod (and the way music distribution was changed by its adoption) and the original iPad. What Apple managed to do with the iPod was take a class of product that already existed – the mp3 player – and truly design something consumers wanted with an ease of use that was unmatched in the field. It’s not that other companies weren’t making portable digital music players, but the process of getting music on them and then listening to that music was far more cumbersome than it should have been. Apple came along and simplified the entire process and it’s hard to overstate what iTunes and the iPod did for the tech industry, the music industry and, most importantly, Apple as a company. Then the iPad came along and again took an idea that others were poorly trying to execute and made it simple and elegant. By the time the original iPad came out, Apple had enough of a following from the iPod/iPhone craze that the device’s popularity took off and changed how people were interacting with content all over the world. It raised the bar for tablets everywhere and forced all other companies wanting to compete in the tablet space to rethink how they were designing and implementing their products. But honestly, other than those two products, it’s hard for me to think of anything genuinely innovative Apple has done recently. Take the latest release of products that were just announced yesterday; the iPad 4 and the iPad mini. 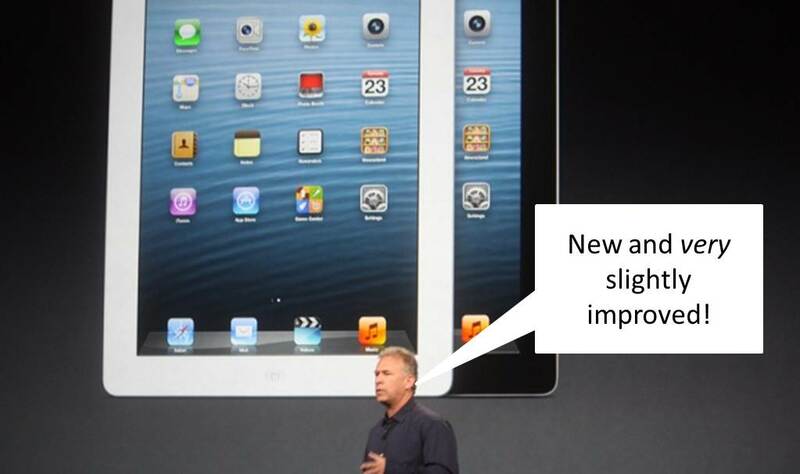 The iPad 4 is, quite simply, a slap in the face to anyone that purchased the New iPad just a few months ago. It’s essentially the same device with a few hardware upgrades. But really, that’s what all the iPads have been. After the iPad 1, every update has been only a minor evolutionary upgrade. Even iOS has failed to update drastically. Sure, every iOS update and new version of an iPad is released with a marketing spin of “this changes everything” but if I compare my iPad 1 to the latest iPad release, there’s really not a big difference (other than the fact that Apple has stopped updating my iPad. So I now have an $800, 2 year old device that’s unsupported by the manufacturer. That’s a different article for a different day, though). Most of the updates to iOS have been made in an attempt to keep up with other, more evolved mobile OS’s; namely the Android OS from Google (which has plenty of its own problems but is at least packed with tons of features). Not exactly what I would call innovative. As for the iPad mini, it’s basically an overpriced rip off of every other small-form tablet on the market. Apple saw competition from the Kindle Fire HD and the Google Nexus 7 and decided it should get in on the small tablet game. It took the old hardware from the iPad 2 and shoved it into a slightly smaller body and rushed it out before the holidays started. And for the first time, I’ve actually seen some of the media report on this for what it is: a blatant cash grab. Apple is feeling pressure from the competition and needed to crank out a few more products to stay relevant. Nothing innovative there either. Compare that, however, with the other big tech release this week: Windows 8. I don’t think a single company has changed as much as Microsoft has changed this year. They have released completely overhauled and new versions of every major product, two tablets that seek to answer the frustrating question of “but how do I actually get things done on a tablet” and a phone that I’ve heard almost nothing but praises for. Microsoft is a company that has put its entire future on the line by radically changing the interface and user interaction of the most popular OS in the world. It’s pumped tons of money into a new line of tablets (the Microsoft Surface) that marry with Windows 8 in an amazing way. They’re not just aiming for gloss and shine but instead are trying to release products that earnestly help people accomplish their goals. Now that is true innovation. And while Google doesn’t have a strong hold in the desktop/laptop marketplace, it continues to innovate in the smart phone and tablet arenas. All while mapping the world, building driverless cars and inventing the glasses of the future. I hope Apple returns to true innovation soon. When the iPod and iPad first arrived, it pushed the rest of the industry to have to move forward. It helped define a new class of product and set the standard for all other companies to live up to. Sadly for Apple, the competition seems to have not only lived up to the standard, but passed it and left Apple looking a little silly. If you’re a consumer with money and want to buy what everyone else is buying, then go pick up an Apple product (just know that a year down the road, it will be treated like a rotary phone by the company that made it). If you really want truly innovative products that are looking to define the next wave of tech products, go to the competition. My bet is on Microsoft for the next round.